Well I had one great Fourth of July weekend which made going back to work today a little bit harder. While I spent the weekend up at Flathead Lake and I did have my camera with me, I really didn’t do much shooting except for a couple photos I posted on Instagram. Yes that’s right, I am on Instagram now! I even lucked out with a real easy handle, jakepetersonphotography. Not bad eh. Well since it is Monday I thought I would put up this fun shoot from North Dakota two weekends ago already. Now I’ve never been much of a selfie person and in fact I really don’t even like getting my portrait taken. Most times I crack a bad joke whenever someone does take my picture. 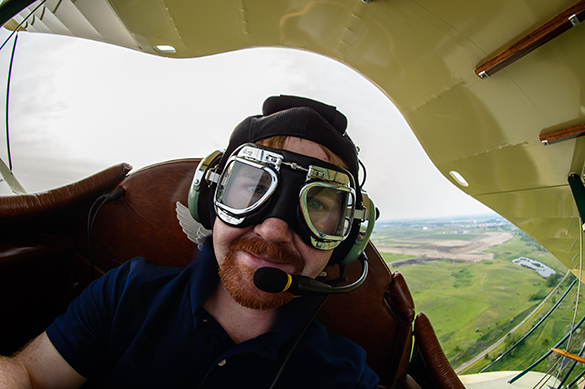 Well during this air to air mission, I had the D4 and 16mm fisheye with me for one purpose, to take my own selfie. 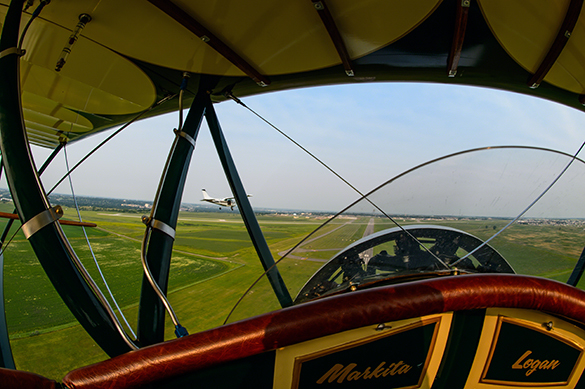 Now the goal of the photo mission was not to do that at all, it was for Mark, seen here in the Cessna 182CJ to get experience photographing the subject plane, the Waco QCF-2 that I was in. Most of the time my camera was down to do just that; however, at certain moments I had to put the camera up and get a quick shot. Why? Well it’s not everyday you get to go fly in a Waco especially with a legendary pilot like Warren Pietsch. As you can tell by this photo we weren’t exactly flying straight and level. Needles to say holding the camera steady wasn’t easy.